An assiduous person works hard to ensure that something is done properly and completely. When you are astringent towards someone, you speak to him or write about her in a critical and hurtful manner. If you describe something as austere, you might approve of its simple and plain style. You use blithe to indicate that someone does something casually or in a carefree fashion without much concern for the end result. If you describe a system or process as byzantine, it means that you are criticizing it because it is excessively complicated and difficult to understand. If you are being circumspect, you are being cautious and you think carefully about something before you say or do it. A conjecture is a theory or guess that is based on information that is not certain or complete. Something convoluted, such as a concept or procedure, is complex and takes many twists and turns. A cursory examination or glance is very quick, incomplete, and does not pay close attention to detail. If you deliberate, you think about or discuss something very carefully, especially before making an important decision. Didactic speech or writing is intended to teach something, especially a moral lesson. Someone who is erudite has a lot of knowledge because he or she has read and studied extensively. If you describe someone as exacting you mean that she or he expects other people to work very hard and carefully. Something that is extemporaneous such as an action, speech, or performance is done without any preparation or practice beforehand. If you say that someone is fastidious, you mean that he or she cares a lot about small details and wants to keep everything correct and tidy. Something that is hypothetical is based on possible situations or events rather than actual ones. If someone is impassive it means that she is not showing any emotion. Someone is considered meticulous when he or she acts with careful attention to detail. A niggling feeling is slight and not really serious but irritates or bothers you over a long period of time. Someone who is nonchalant is very relaxed and appears not to be worried about anything. Something that is notional exists only as an idea or in theory, but not in reality. If you are oblivious to something that is happening you do not notice it. If you peruse some written text, you read it over carefully. To be punctilious is to pay precise attention to detail. A scrupulous person takes great care to do everything in an extremely honest and fair manner. Someone who is sedulous works hard and does things very carefully and thoroughly, not stopping any task until it is completely accomplished. A spartan lifestyle is very simple and severe; it has no luxuries or comforts. To act in an uncouth manner is to be awkward and unmannerly. An unkempt person or thing is untidy and has not been kept neat. If you repeat something verbatim, you use exactly the same words that were spoken or written. If something like power, influence, or feeling wanes, it gradually becomes weaker or less important, often so much so that it eventually disappears. A whimsical idea or person is slightly strange, unusual, and amusing rather than serious and practical. If you refer to someone as a yokel you think that he is not very intelligent and does not know much about modern life or ideas because he stays put in the countryside. Professor Snape, in the Harry Potter books, is considered to be pedantic because he is overly concerned about formal rules. Snape will often choose to be unreasonable because his pedantic nature leads him to place dull, precise regulations over people. His obvious discomfort when other, less pedantic teachers allow rules to be broken shows in his short and angry replies to these more lenient actions. As a pedant, he finds any such irregularities annoying because he thinks that all rules are to be followed to the letter. Quiz: Try again! How does someone act if he is pedantic? He is very picky about sticking to every part of each and every rule. He is concerned about being a law-abiding citizen. He is concerned about other people. If someone is pedantic, she or he gives too much importance to unimportant details and formal rules. Pedro the Romantic "Should I ask her out before or after I see her? Should I try to kiss her before, during, or after the movie? Should I try to hold her hand for 2 minutes, or 5? I have to do it right!" Thus went the mind of pedantic Pedro the romantic 18.5 hours per day. A pedant used to be a word that meant “schoolmaster;” a teacher tends to be an enforcer of rules, which the student, or child, is expected to follow. 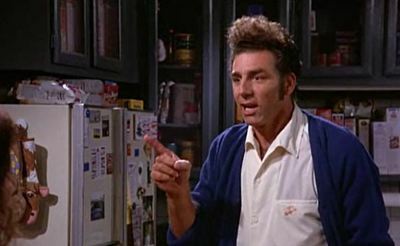 Seinfeld Kramer is being pedantic.